Robinsons have brought out a new range of flavoured spring water drinks made with real fruit and are made from “Naturally Sourced Ingredients” and have no added sugar and are sweetened with Steviol. 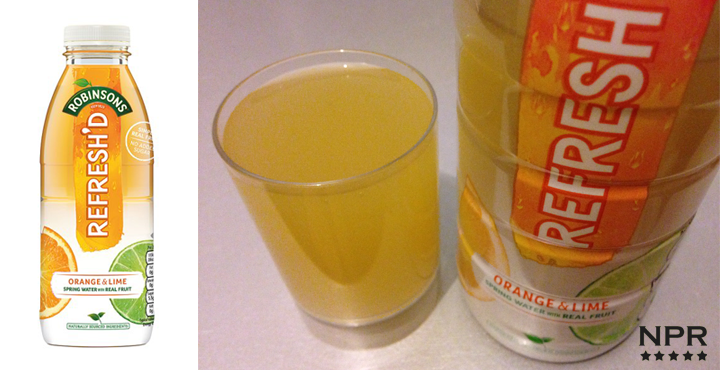 This drink is the Orange and Lime version and straight away it has a familiar Orange and Lime drink flavour…for about a second before it goes into a different tangent, a deeper citrus rind flavour, a more real Lime like flavour and becomes slightly bitterish. The drink becomes less sweet as it travels along your tastebuds, not that it is a very sweet drink in the first place. Its like a mix between a pure orange juice drink and a lime squash drink. I’m not sure if I like the taste, it takes some getting used to, its a refreshing natural tasting drink for sure but I’m not 100% on the Orange and Lime mix.